The Crosse Keys (aka best burgers ever) - The City | RAWR BOWS. If there is something I absolutely love no matter what is eating out. I love food in general, obviously, and nothing can beat a good meal out. I am currently working on a post about my favourite places to eat in London so look out for that. I recently discovered Eventbrite and decided to join their project called Hometown Hunt which encouraged me to share with you all my favourite local spots. Eventbrite is an amazing site that helps you find events in your areas. Also, they have free event management tools to get the word out about your event, sell tickets, and track your event progress so you should definitely check them out. 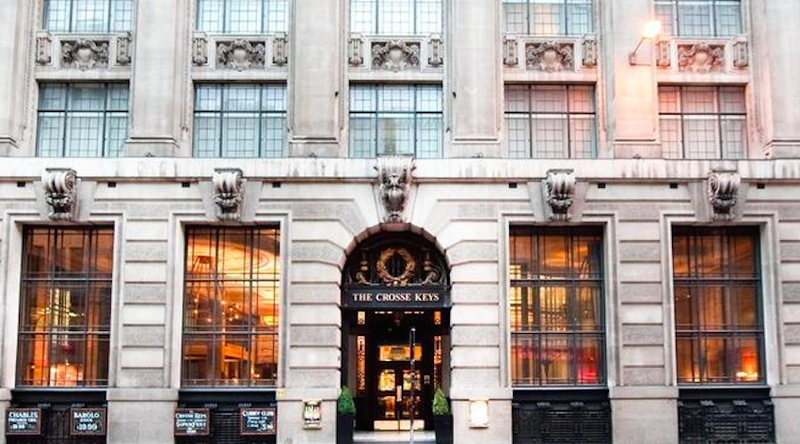 As I have already said I am going to talk about my favourite - or one of my favourites - local spot here in London and that is a pub called The Crosse Keys. The Cross Keys is a Wetherspoons pub located in the heart of The City, very close to all the skyscrapers and cool buildings. The local is an old bank lobby, it is enormous and I think it looks quite fancy and cosy. Because it is a pub it is open from early hours in the morning to quite late at night. As you all may know I am Spanish meaning that I have lunch and dinner considerably later than most English people so it is nice to know that it is open all day and I can go have lunch at 3pm. I normally go with my flatamtes who are also Spanish and we tend to stay there for hours talking. When I say hours, I mean leaving the pub at 6pm. No joke. It is a really nice place to go for lunch with your friends and chill out for a few hours after that. The atmosphere is really nice and it's not too crowded on the weekends, which is really rare for London. Now, let's talk about the important bit, the food. Let me first say I am not a big fan of pub food as it tends to be too greasy for my taste but they have the best burgers in London, and I've had a lot of burgers. The burgers are not only stunning but they are also really cheap for London, if I remember correctly it is about £8 for a burger with fries, onion rings and a soft drink. Not bad, huh? To sum it up, if you are looking for a nice place to eat some comfort food with your friends and don't feel like splurging, this is the place to go! P.S I am waiting for my sister to send me a picture of the delicious burger I had. For some reason the picture is in my computer at home so yeah that is a bit of a problem, but it should be up soon!